The Peoria Area Civic Chorale is proud to organize and sponsor three annual festival chorus opportunities for students in grades 4-8. Schools throughout Central Illinois nominate their finest students to participate in a chorus that is comprised of approximately 90 singers. Students work with a guest conductor in a two day festival experience that concludes with a performance during the Civic Chorale’s An American Family Christmas concert or Spring Show. 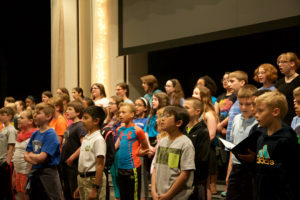 Students enjoy the opportunity to work with an advanced choir and perform in the professional atmosphere of Washington’s Five Points Performing Arts Center.